Up until this point, the Deployment procedure has only considered metadata. This means that your target environment now hosts "the shell" of your project, that is, all of the imported processes and parameter entities. If you have data on your development environment that you wish to preserve in your target environment, then you need to perform a Data Synchronization. 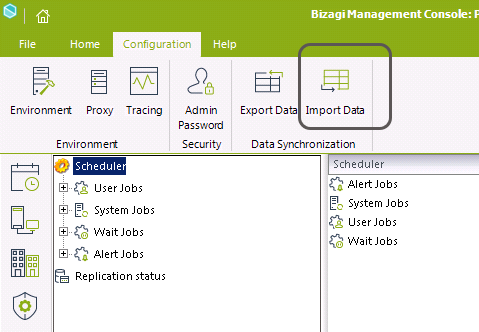 How to perform a Data Synchronization procedure? The Data Synchronization consists of two utilities that are launched from the Management Console: Export data and Import data. The first step is to generate a .bdex file which is the result of the Export data procedure performed on the Source environment. After that, the next step is to import such .bdex file into the target environment by launching the Import data procedure from the Target environment. •Parameter Values managed in production. Bear in mind that you can only import data into an environment whose metadata counterpart has already been deployed. This means that if you have not deployed an entity into an environment, you cannot synchronize its data into the same environment. If a parameter entity is selected to be considered in the synchronization process, all of its registers are taken into account. This means that you cannot individually select which elements to include and even unused values are included in the .bdex file. This utility lets you handpick the data from your development environment to include on the .bdex file. 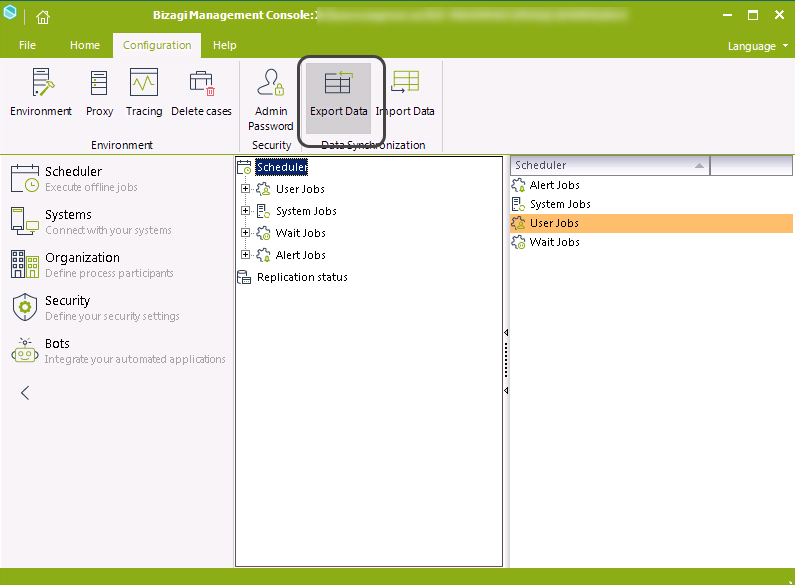 Launch this tool from the Management Console inside the Configuration tab on the ribbon. 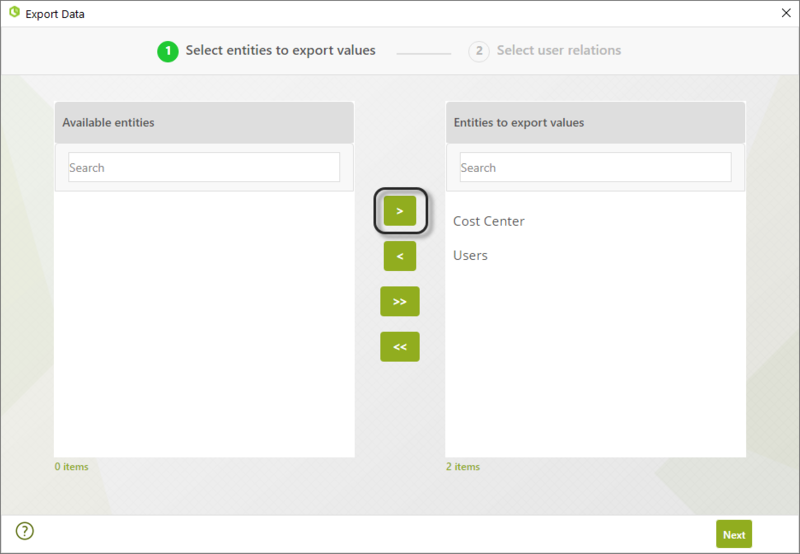 The Export data wizard is displayed. The wizard guides you through the Export procedure. At the top part of the window you can see at what step of the procedure you are in. 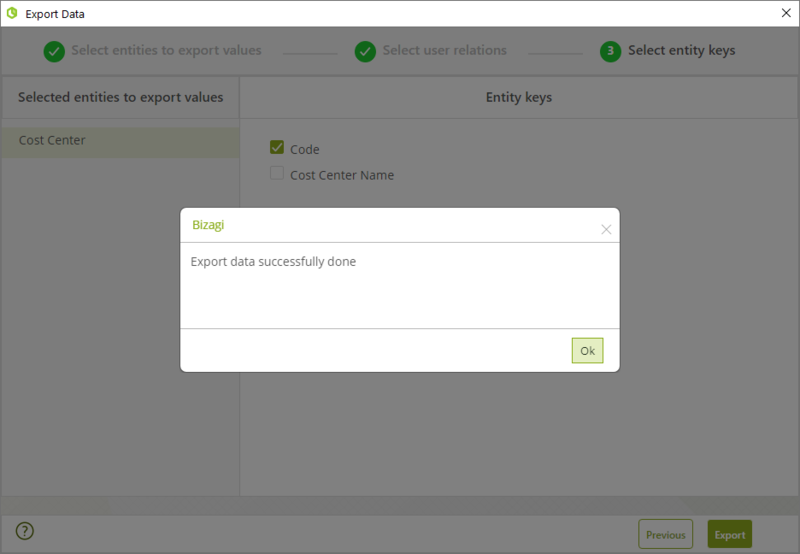 The first step lets you Select the data to export. From the left panel tick the data elements that you want to include in the .bdex file, and the click Add. Those element are now visible on the right panel, which means that they will be included in the .bdex file. Click Next when you have finished selecting the data to export. 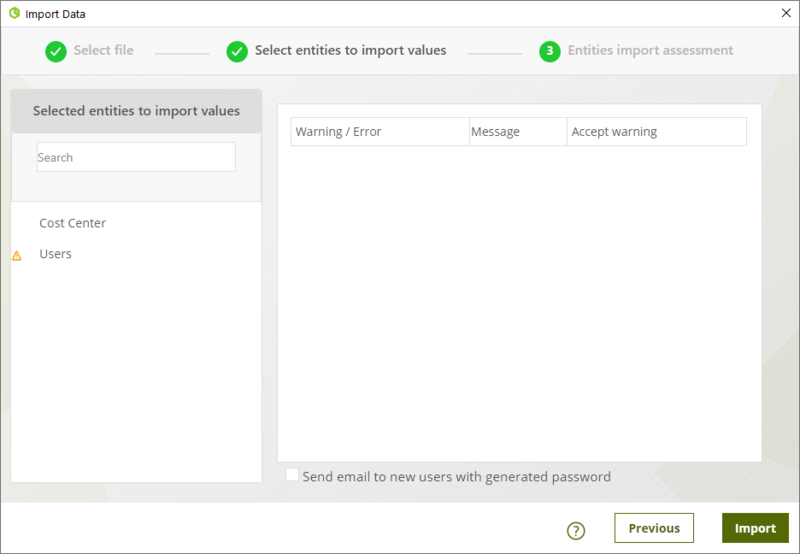 Make sure you have ticked all of the elements that you wish to import since the ones that are not included will not be available in the import procedure. 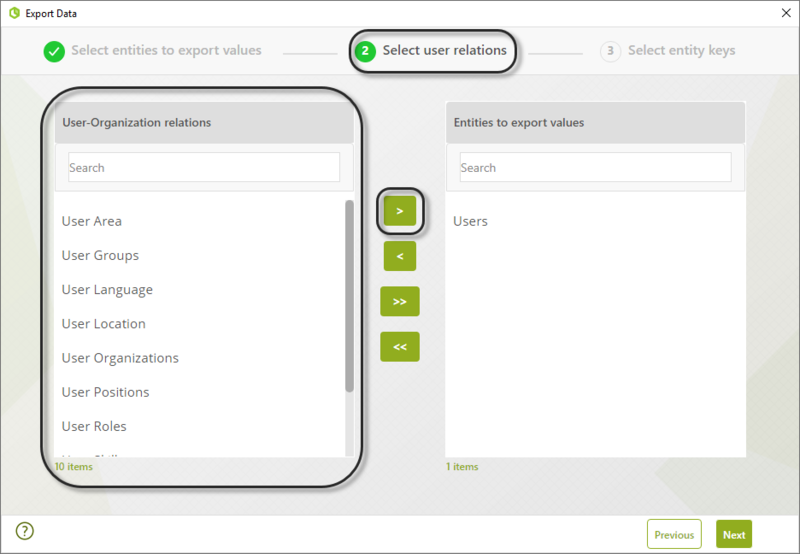 After clicking Next you have the opportunity to select the user relations that to export. 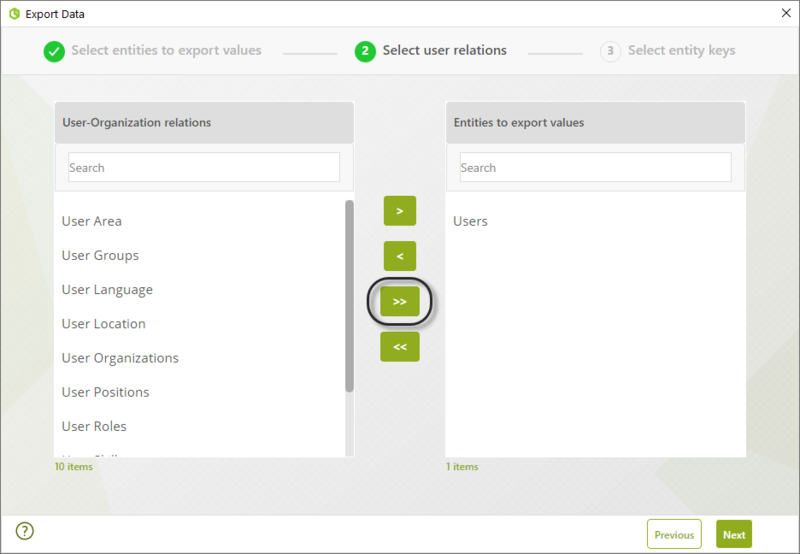 Once again, tick on the left panel the user relations you want to export and then click Add to make sure they are included in the right panel. You can always tick the box next to Available data to tick all of the options at once. At any time, you can go to the previous step to review what you have included by using the Previous button on the bottom right part of the window. If you identify an element that has been mistakenly included, to exclude it you only need to tick it on the right panel and then click Remove. 1. Random passwords are generated for all the synced users. 2. Each user is marked as expired, this way they are prompted to update their password on their first log-in attempt after the synchronization. 3. The user performing the synchronization decides whether to send an email asking users to change their passwords. If he decides not to do so, the admin user must change in the Work Portal the passwords of each of the newly synced users. 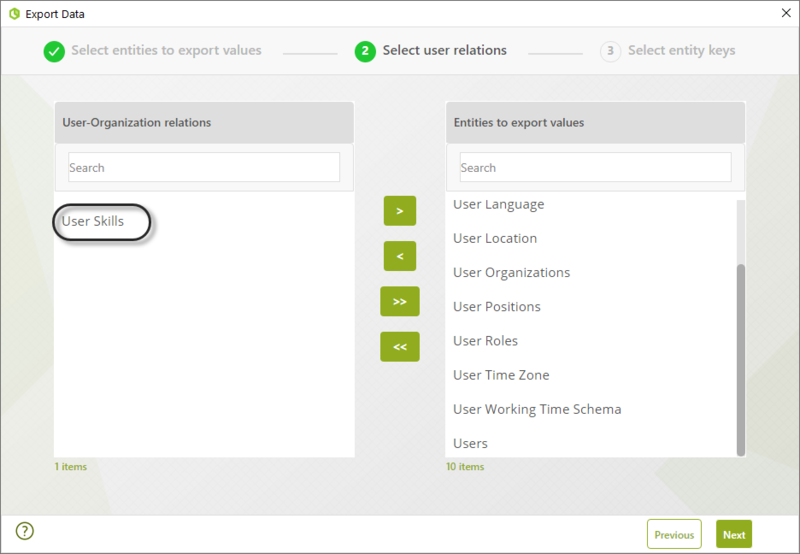 Once you are done selecting the Data and User relations to export, click Next to head to the third and last step of the wizard. In this window, all the entities included in the first step of the wizard are listed on the left panel (Selected data). When you click on an entity in the left panel, the wizard will show you the available attributes for you to select the Entity key. 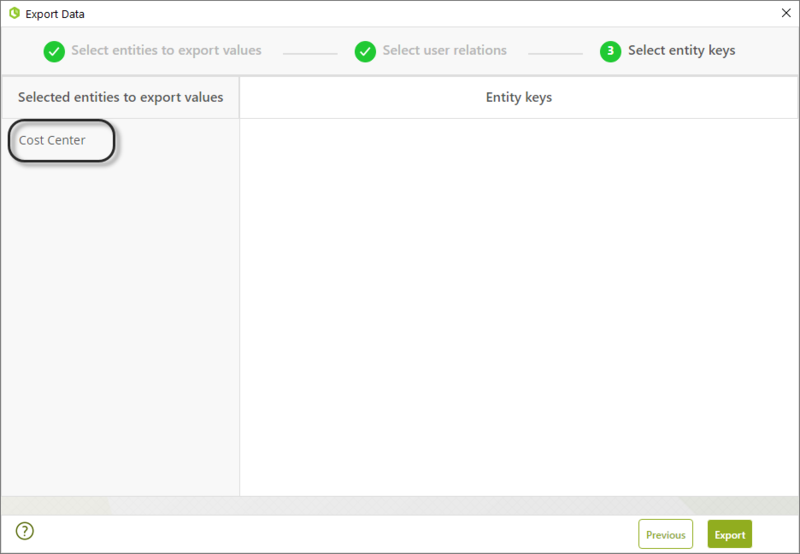 This key is used in the import procedure to compare the existing records on the target environment against the ones exported from the development environment, which is done to prevent the Data Synchronization from creating duplicate records. Select the combination of columns that uniquely identify each record of the entity. Do so for each of the entities listed on the left panel, and once you are done, click Finish. 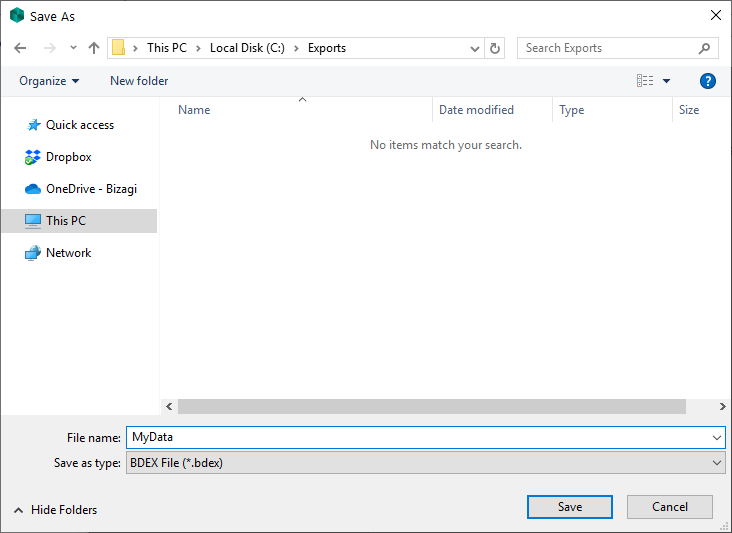 On the displayed file explorer, provide a name to the file and select the location where it will be saved to. Click Save to generate the corresponding .bdex file. A pop-up alert will inform you if the file was successfully generated or if an error occurred. 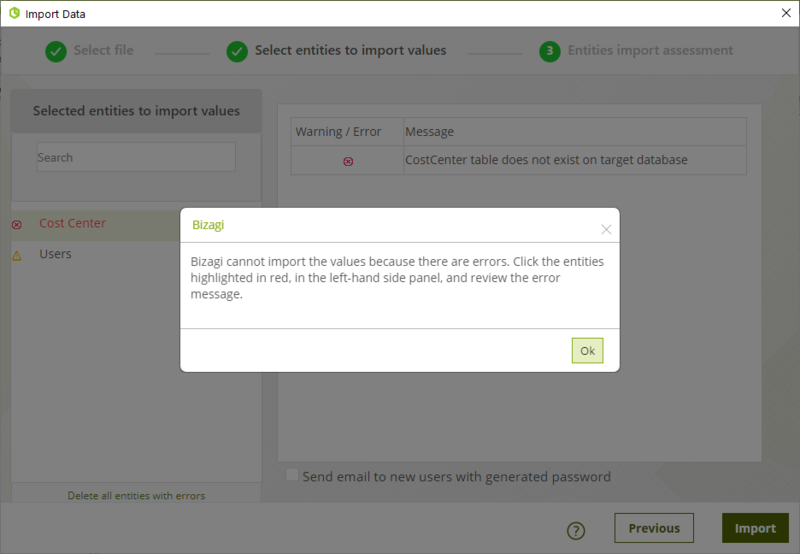 To apply the newly generated file into your target environment, rely on the Import data procedure. Continue reading the next section for a step by step guide on how to use it. 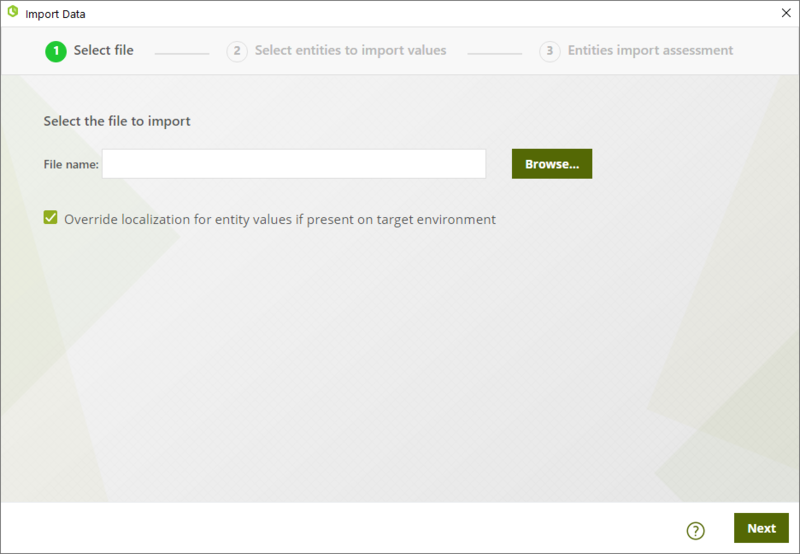 To synchronize data into your target environment, you need to import a .bdex file generated by the Export data procedure. This procedure needs to be performed in the Management Console of your target environment. Launch this utility from the Management Console on the Configuration tab. 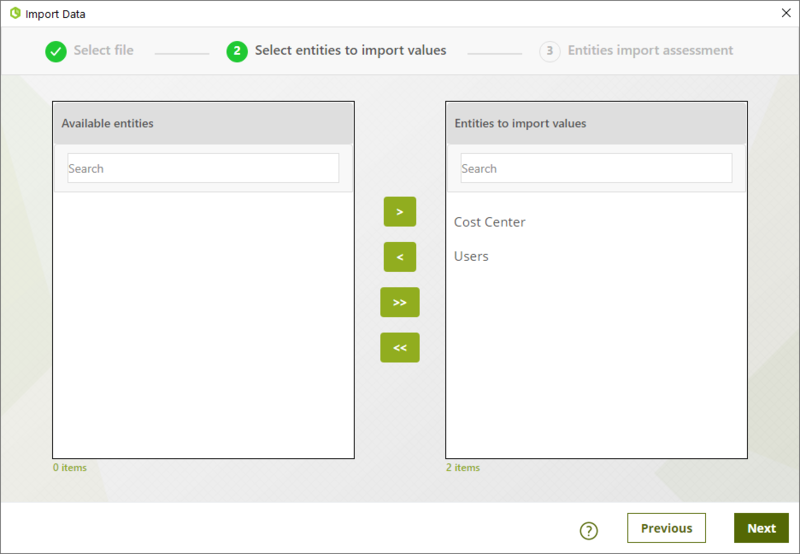 The Import data wizard is displayed. The top part of the wizard informs you at what step of the procedure you are in. The first step is to select a .bdex file to import. Click Browse to display a file explorer. Navigate your file system and selected the .bdex file that contains the data you want to import. Click Open the select the file and then click Next to move on to the next step of the import procedure. The second step of the wizard is displayed. In this step, two columns are shown. The one on the right lists all of the data from the selected .bdex file that is going to be imported into the environment. By ticking each element individually you can Add or Remove data elements from this column in order to handpick the objects that you want to include in the import procedure. Once you have moved the elements between the columns according to your needs, click Next to continue to the last step of the procedure. This screen has two panels, the one on the left shows the selected elements. You can click on each one of them to review if there are Warnings or Errors that you may need to resolve or take into account before continuing with the import procedure. Those messages are shown in the main panel. 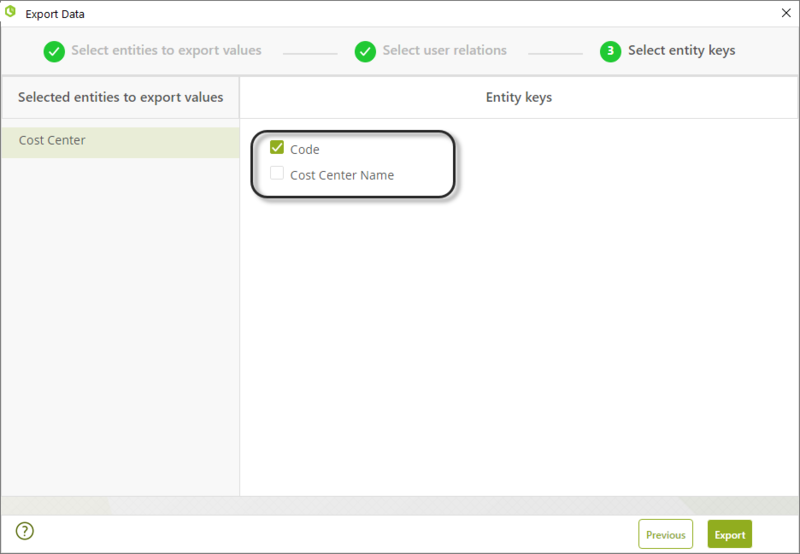 For example, you can appreciate in the image above that there is one error related to the Cost Center entity: One of its registers is already present in the environment by analyzing them with the entity key selected in the export procedure. For this specific case, the solution is to export a new .bdex file where the entity key is more specific, namely selecting more columns as the entity key. 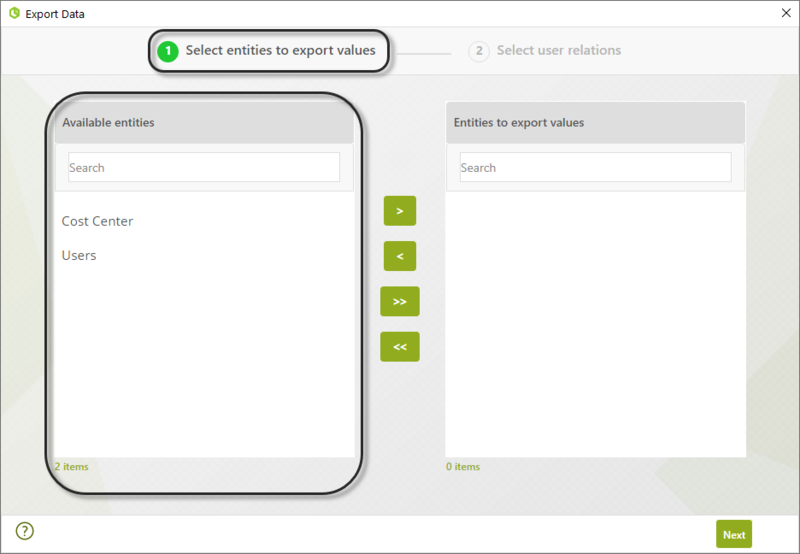 Another alternative is to go to the previous step of the wizard and leave that entity unselected on the import. The solution that you may apply depends on your business needs at the given time. If you try to continue with the procedure without fixing the issue, an pop-up message displays and prevents you from effectively applying the .bdex file into your environment. Warning messages are shown in yellow. This type of messages inform you about a possible problematic situation, and lets you address it by approving (or not) the solution provided by Bizagi. This situation can be evidenced in the following image. Warning messages, unlike error messages, don't prevent you from continuing with the procedure. As soon as you finish reviewing and resolving errors and warnings, click OK to effectively import the data into your environment. If everything runs smoothly, the following message is displayed. At this point you have finished Synchronizing your data from your development environment into your test or production environment! 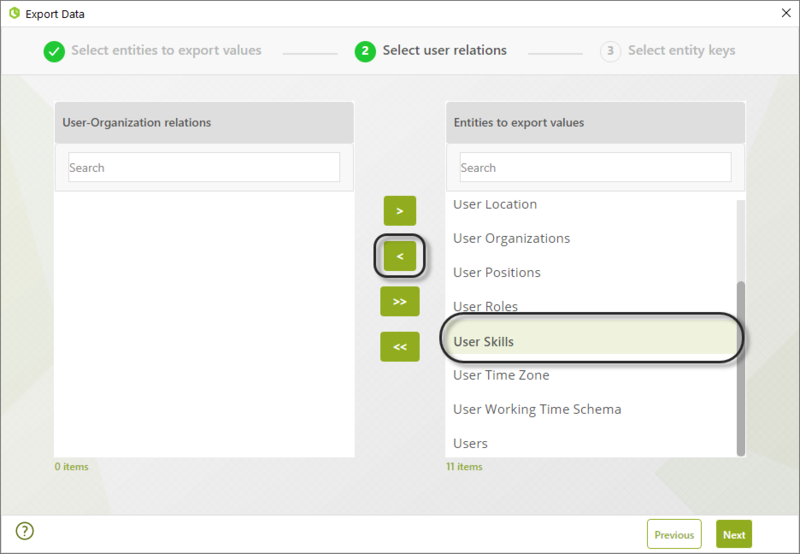 you can now use those values and information from the Work Portal or from wherever they are used in. 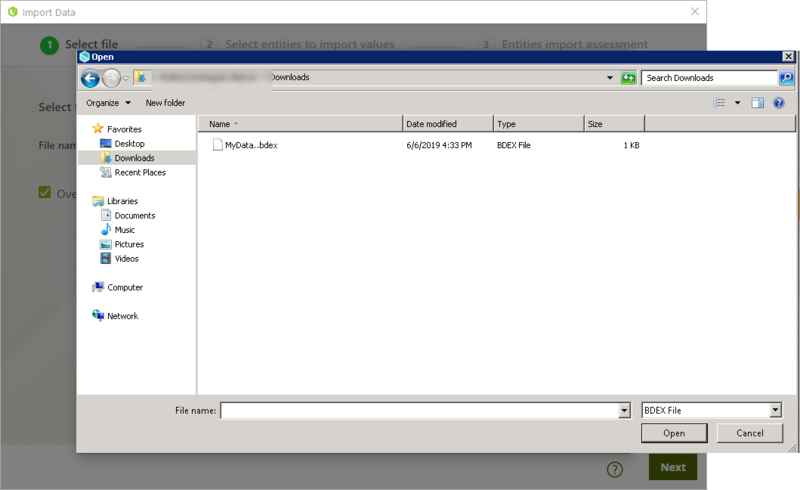 1.Generate the .bdex file with Export data procedure from your Development Environment. 2.Log into your Automation Service Management Console through your virtual machine and perform the Import data procedure.